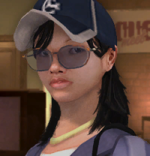 From Russia Without Love is the name used by a female love-meet.net user in Grand Theft Auto IV. 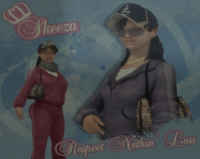 No matter how many times Niko Bellic contacts her, she will never date him. Her name references the James Bond movie, From Russia With Love. She can be seen on a wall around the corner of the hospital near Star Junction, and she appears to be a model. Also, based on her profile, she appears to be a gold digger and preys on wealthy older men, stating she wants a "much older guy" with "little to no kin". About Me: I came to this country from Russia looking for a man who wants to make a commitment. I'm the 'til death do us part type' I want to find an older guy, a much older guy, with little or no next of kin. Likes: I like mature men who don't get along with their kids. I like people who'll just look at my chest and not ask any questions. I also like heart conditions, Alzheimer's and wheelchairs with shoddy brakes. Dislikes: I dislike having to explain where I've been. I dislike that Mollis is so easily available here. I dislike funerals, once you've been to one; you've been to them all. You are far too young and healthy for me. This page was last modified on 26 October 2013, at 14:41.